The latest wave of bad news came out of Detroit Friday morning as both GM and Ford reported heavy losses for the third quarter of 2008. Ford lost $2.75 billion, pretax, from operations; GM fared even worse, losing $4.2 billion, excluding a one-time gain. Both companies are also burning through cash at an alarming rate  Ford used up $7.7 billion during the third quarter and GM burned through $6.9 billion. 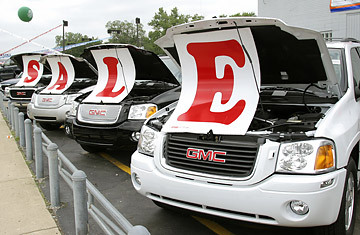 Concerns intensified about GM's ability to stay afloat. The losses added yet another note of urgency to auto industry leaders' discussions with Washington, which were in the spotlight on Thursday when the chief executives of GM, Ford and Chrysler met with House speaker Nancy Pelosi and Senate majority leader Harry Reid on how to increase the size of Washington's aid package to the Big Three. Though details are still being worked out, the push is for an additional $25 billion in federal loan guarantees for Detroit in addition to the $25 billion already promised to assist the industry's shift to green technology. Though there is certainly some resistance on Capitol Hill and in the White House to a further injection of money into the faltering automakers, the potential cascading effect of a collapse of one of the Big Three may ultimately force Congress to act. And while many observers have said a GM or Chrysler should be allowed to go into bankruptcy to try and reorganize (and even possibly renegotiate some of its burdensome union contracts), there are many in the industry who argue that consumers will not buy cars from a company in bankruptcy for fear that warranties will not be honored or parts will not be available down the line. In the midst of these woes, autoworkers are facing a swirl of bad news, including Ford's Friday promise to counter losses with still more cuts in personnel. Moreover, labor has largely been out of the loop on GM's reported merger talks with Chrysler, despite the likelihood that major job cuts would result from any deal. "We haven't been told anything," said Jeff Hagler, president of UAW 412 in Warren, Mi. The union has hired Steve Girsky, a former Wall Street analyst who has served as an adviser to GM, to help guide it through what promise to be very complex merger negotiations. The one silver lining for workers, at least for now, is that the merger talks have been pushed to the back burner due to GM's more immediate cash crisis. Obama didn't go into any specifics at his first press conference Friday, but he made it clear that the industry's woes are a top priority. "The news coming out of the auto industry this week reminds us of the hardship it faces -- hardship that goes far beyond individual auto companies to the countless suppliers, small businesses and communities throughout our nation who depend on a vibrant American auto industry," he said in his opening statement. "The auto industry is the backbone of American manufacturing and a critical part of our attempt to reduce our dependence on foreign oil." The push is on to make something happen even before Obama takes office. "To permit any of the Detroit Three manufacturers to collapse, would scar the U.S. economy further at a time when it can ill afford another blow," said David Cole, Chairman of the Center For Automotive Research in Ann Arbor, Mi. "The likelihood of one or two of the Detroit Three manufacturers ending operations is very real" he added. See the Top 50 worst cars. See the Top 10 fictional cars.